theEword SEO copywriter Tom Mason reveals the top 10 reasons to use lists in content. Lists are easy to write. An SEO copywriter does not have to spend hours researching a subject and it's relatively easy to compose two or three lines on a particular point. Lists are easy to read. Users can quickly absorb an argument or opinion in a minimal amount of time. This is compared to larger documents which make take a significant period to digest. Lists are ideal for social media. Readers do not have to spend their time wading through whole paragraphs to deem whether a piece of content is worthy of a re-tweet. Similarly, copywriters can include an influential blog or twitter user in a list to boost the chances of a mention from that particular account. Lists are a great way to cover a lot of information quickly. The format gives copywriters the opportunity to broach a number of different topics without fear of losing the reader mid-paragraph. Lists require brevity and copywriters need to be able to make an argument in a limited amount of characters. If nothing else, the format is good practice for working within a set number of characters; Twitter, for example. Lists can be creative. This format allows SEO organisations to present information in a fresh and interesting format. Lists are great linkbait. They are perfect for attracting inbound links from related blogs and sites. Lists are perfect for those wanting to focus on a specific keyword. 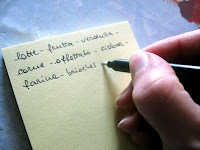 The nature of lists allows for the subtle repetition of certain words and phrases. The lengths of list can vary considerably. Ultimately, the number of bullet points is chosen by the writer and a list can be as comprehensive or concise as necessary. The final point in a list can be used as a plug for a service or company. For example, theEword offers bespoke SEO copywriting and you can contact us for more information.